You’ve heard all about how nutritious and delicious shiitake mushrooms are, but do you really know how to get the most out of this powerhouse fungi? Shiitake mushrooms have a large, broad cap that is a deep brown on the top, and a cream color on the underside. The stem is thin and fibrous, sometimes with a shaggy appearance. Their flavor is unlike any other - rich, buttery, and umami, with a meaty texture. The natural, wild, growth of these aromatic mushrooms has dated back over 100 million years in Eastern Asia. It is legend in China that Shennong, an ancient deity, gifted the world with medicinal mushrooms, including Shiitakes, and the mushroom has been included in Asian cuisine for hundreds of years. Although these mushrooms do grow wild, many are found today cultivated on cut logs plugged with spawn, or on special logs made of sawdust. You can even grow them easily at home using these simple kits. Mushrooms in general are a nutrient-rich food. A number of scientific studies on mushrooms have shown great health benefits to adding edible fungi to your diet. Specifically, shiitake mushrooms have been shown to have properties that lower cholesterol, help regulate the immune system, protect your liver, and inhibit tumor growth. Shiitakes also have some anti-diabetic, anti-obesity, anti-viral, anti-microbial, and anti-bacterial properties. Some mushrooms are sold as extracts, which means a process is used to isolate the medicinal properties of the mushroom based on their solubility in water, alcohol, or oil. Fresh mushrooms not only contain all of the benefits listed above, but they also taste great! If you want to learn more about the health benefits of mushrooms, check out Healing Mushrooms: A Practical and Culinary Guide to Using Mushrooms for Whole Body Health. Shiitake mushrooms may be intimidating with their rich history and superior nutrition, but with today’s post, you will find out just how easy it is to select, store, use, and preserve shiitake mushrooms. Select the right fresh or dried shiitakes. Traditional dried shiitakes have deep white fissures in the caps, and are believed to have the most intense flavor. Fresh shiitakes should be umbrella shaped, and the edges of the caps should roll inward. The stem and the underside of the cap should be tan to white, and the mushrooms should not be wet. Visit our events page to find when and where you can get fresh shiitakes from our farm. For the winter season (December through April), check out our Winter CSA page. Dried Shiitakes should be stored in an airtight container in a cool, dark place. They can be stored this way for six months to a year. You can do this in your refrigerator for a prolonged shelf life. Never rinse fresh mushrooms before you store them. Fresh shiitakes should be stored in a paper bag in the refrigerator until you're ready to use them. They can be stored this way for 7 to 10 days. Shiitake mushrooms should always be cooked before consumption. This not only allows those beneficial compounds to be released and broken down into forms that our bodies can process, but it also prevents the possibility of shiitake dermatitis, an allergic reaction to raw shiitakes. Dried mushrooms must be reconstituted either before or during cooking. This means that you should either soak them in warm water for 5 minutes prior to using them in your recipe, or if there’s enough liquid and cooking time in your recipe, you can just toss them in dried. If you opt to reconstitute beforehand, you can use the soaking water in any recipe for more flavor (just be sure that it gets cooked)! 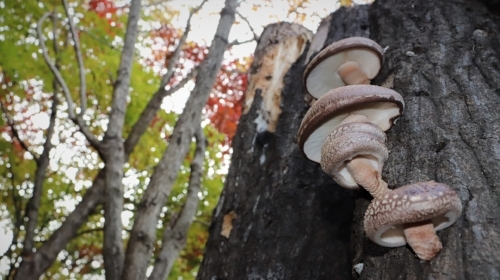 Shiitake stems are not easy to eat - they’re tough and fibrous - but they do have a lot of flavor! After you remove them from the tender caps, you can use the stems by adding them to your stock pot when you’re making broth. Once your broth is finished, you can discard the stems, or compost them! Shiitake caps can be roasted whole, sliced, or diced and sauteed, and even grilled. These meaty and nutritious mushrooms can be found in broths, vegetarian dishes, and stir fries, among many others. Try this recipe for fried rice, which pairs well with your choice of protein and vegetable! My favorite way to serve this fried rice is with pork pot stickers and broccoli. If you think you won't be able to use fresh shiitakes within 7 to 10 days of purchase, lay them out on a cookie sheet in the fridge to allow them to dry out. You can do this with our without the stems. Once they’ve dried out and the caps are firm (a few days), you can seal them in an airtight container and keep them in a cool, dry place until you’re ready to use them. You can also slice or chop the shiitakes before you do this, or use a food dehydrator to dry a large batch quickly. The linked food dehydrator is the exact one that I use at home. PRO TIP: Store shiitake stems in a bag in your freezer until you’re ready to use them for a soup stock or broth. You can do this with other produce too! Taking Shiitake as a supplement. Do you love the potential nutritional and health benefits that shiitakes offer, but you’re not a fan of the flavor or texture of mushrooms? If it’s just the texture you don’t like, you can try a shiitake mushroom powder to add to your food, everything from sauce to soup to smoothies. If it’s both the taste and the texture you don’t like, try adding a shiitake capsule to your supplement routine. Always remember to consult a healthcare professional before making any medical decisions. Ultimately, these are the five things you need to know to get the most out of shiitake mushrooms. Pick the best mushrooms, and store them properly, then you can cook with them, preserve them, and most importantly - enjoy them! How will you use your shiitakes next? Try something new today! Thank you! An email has been sent to you to confirm your subscription to the newsletter.